The January gloom continued as the Friends and volunteers arrived on site on Saturday 25th January. No snow to contend with, thankfully, but certainly it was a bit nippy when Friends Director and Site Manager Glen opened up the gates to regular volunteers Paul, Keith and Chris. Following our first working party of 2019, the crew were delighted to see how clear the top end f the site now appeared. 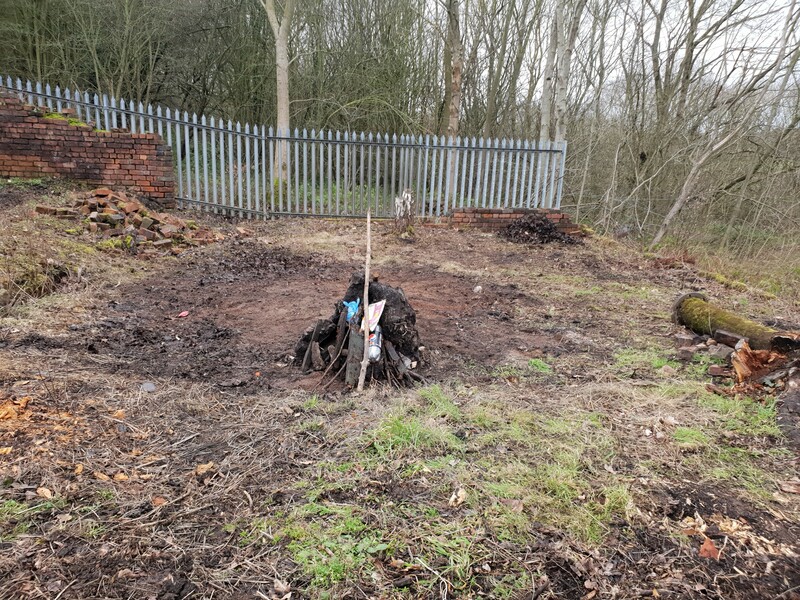 Thanks to the bonfire the tree stumps and rotten timbers were clear and this part of the site looks much more open and clear of roots and stumps getting in the way. Less welcome, unfortunately was the discovery of continued criminal damage being done to the boundary wall of the site. From Wath Road the view of the main winding shaft headgear has, ironically , been getting more extensive top-down as unwelcome and criminal damage is done by removing layers of bricks from the wall. 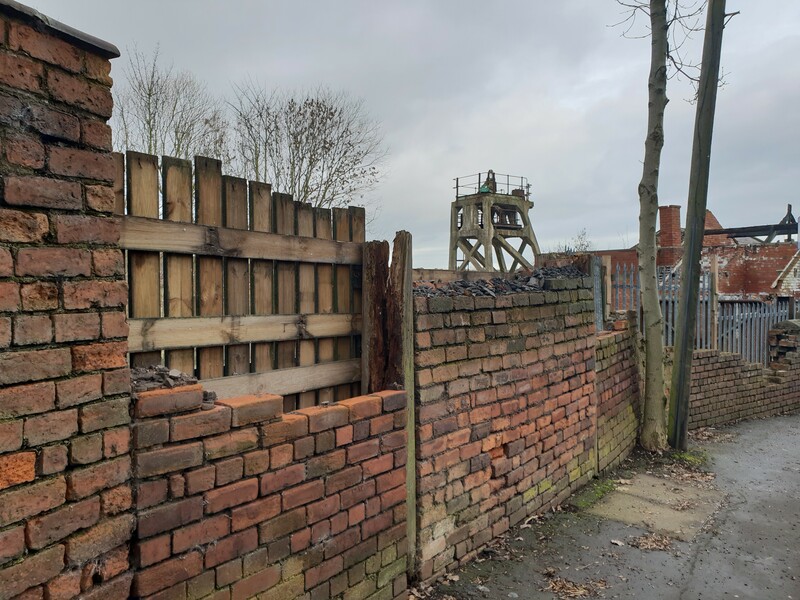 Over the course of the last year this criminal damage has become quite extensive which is particularly disappointing when it is considered that the site is now much more actively visited and looked after than at any stage in the last thirty years. Being maintained by volunteers this mindless and persistent activity is something which the Friends deplore, and would welcome assistance in addressing with the appropriate authorities. Likewise, the wall itself is of a certain vintage in any case, so we are always on the look-out for assistance in repairing or rebuilding. Anyone with any time or expertise to share is cordially invited to get in touch! Marking a change of tack for the Friends, the majority of the day’s activities focused on the rear embankment wall of the site. 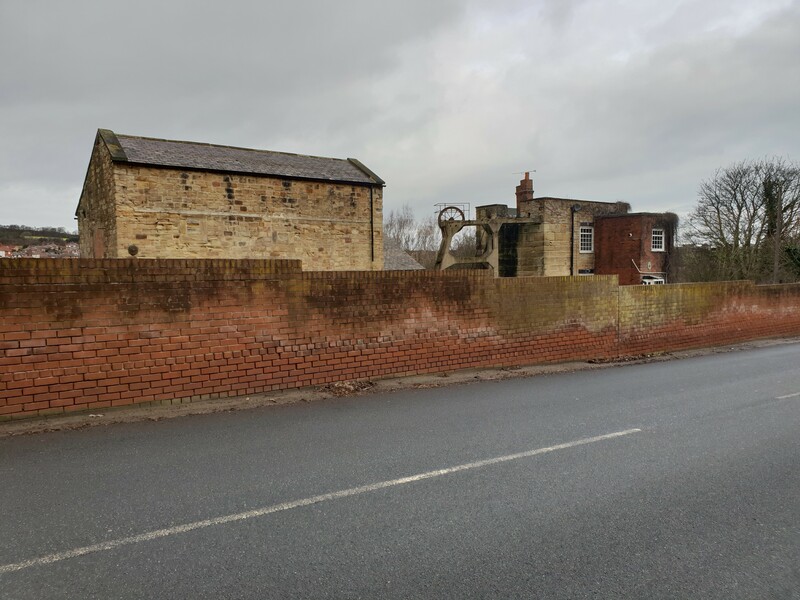 The wall which has suffered some stone collapse, has been the subject of an ongoing programme of checking and making safe by the Friends, though much remains to be done to consolidate and re-build the wall safely. 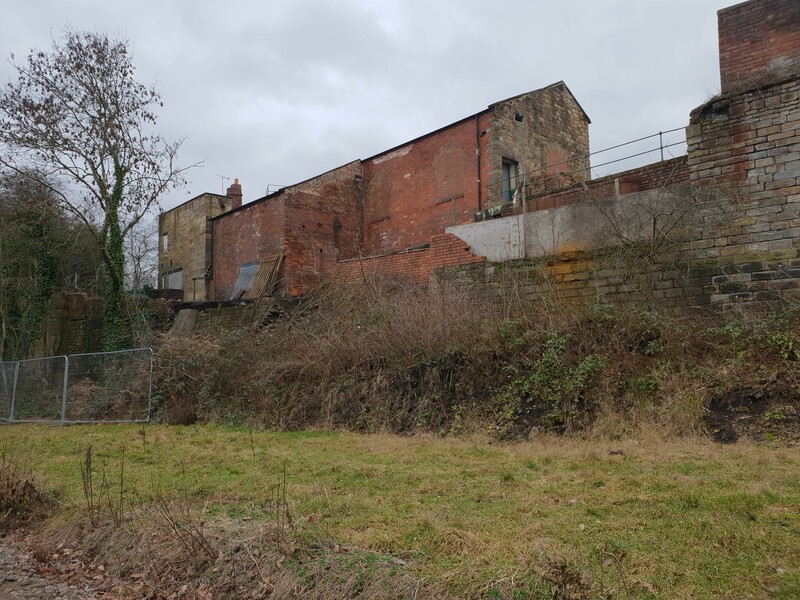 Donning hi-vis and hard hats(we dare not say gilets jaunes), the Friends has previously contacted our Friends at the Elsecar Heritage Railway and agreed permission to inspect our rear embankment wall as well as to begin to clear away the accumulated detritus, fallen stone and brambles. Seeing the pit buildings from the level of the railway line is always enlightening, as well as being a great privilege. Surveying the site from right-to-left, you can see the carefully built sandstone walls of the pit head which once projected out over to the canal basin; then the brickwork of the later alterations to the winding engine house dominate, before the concrete buttresses from the middle of the twentieth century and then, finally the marvellous stone of the bob-wall of the Cornish engine house which once pumped water so regularly from the Barnsley coal seam 150 yards below. After a god afternoon of digging and shifting branches and muck, the crew headed back up to the pit from the end nearest to Tingle Bridge. A fun day with bringing some new perspectives on the site.